Бисквит классический - Очень Простой Рецепт (У Вас Получится 100%) | Sponge Cake, English Subtitles. Как приготовить? Очень простой рецепт бисквита, бисквит у вас обязательно получится. Good afternoon! 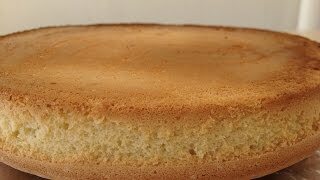 Today we will bake a classic sponge cake.. It's a very easy recipe. You just need to know some secrets..
See the list of ingredients below my video..
You need 2 clean and dry bowls..
A mixer or a blender. Products. The mould I have is for 3 eggs. The diameter of my mould is 7.8 inches. If you use a big mould and a little number of eggs you will succeed any way but your sponge cake will not be that thick and fluffy..
Make sure your mold is clean and dry. If you've got a metal mold cover its bottom with a parchment paper..
Take eggs. Put yolks into one bowl and egg white into the other one. The one which is highter.. There should be not any yolks in the egg white..
Propotions of sugar and flour per one egg: 50 gram of sugar and 50 gram of flour per 1 egg..
You also may use a half norm of sugar and flour per 1 egg but I prefer the amount I have recommended. You may try both variants and choose which one you prefer.. Whip yolks up to its maximum foam. Having received a foam we add sugar: At first add one have of the cup. Do it bylittle portions: one after another. Look and just repeat my moves. Do not expect all sugar to get melted but try to achieve its maximum melting..
Wash the egg whisk before whipping the egg white. Now whip the egg white til you get a thick foam..
Now take the second half of sugar and add it little by little into the whipped egg white. Don't worry if you have a minor amount of sugar unmelted..
Take a teflon or a silicon kitchen shovel (not a metalic one). Grab two portions of whipped egg white. Put it into the whipped yolk and mix it well..
Add a half cup of flour. Mix it in one direction preferably..
Continue to add the rest of whipped egg white by separate portions and mix it well each time. Add the rest of flour. Mix everything well..
All the rest of egg white and mix everything well until you get a homogenius mass.. Grease the bottom of the mold with butter (sunflower oil/olive oil).. Put the dough into the mold..
Let it stand aside for at least 10 minutes..
Prehit the oven up to 392 F. Put the mold into the oven. Reduce the temperature by the regulator up to 356 F..
Find your own temperature regime regarding the type and qualities of your oven.. This is how the dough looks like after 10 minutes of "rest". Time to bake.. This is how our sponge cake looks like after 15-18 minutes of baking..
Let it cool down completely before taking it out of the mold.. Thank yoy for being with me today. Thank you for subcribing to my channel. Put "Like" if you liked it. See you later!